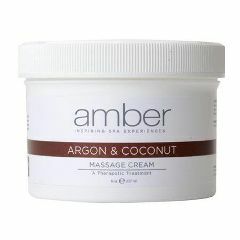 The anti-aging benefits of Coconut and Argan Oil blend with the rich base of Soybean Oil, Aloe Vera and Vitamin E to help heal damaged skin during a massage. Rich in anti-oxidants and essential Fatty Acids prevents the breakdown of skin's elasticity, fights bacteria and free radicals, and helps reduce the signs of aging. Coconut and Argan Oil have natural anti-bacterial, anti-inflammatory and anti-oxidant qualities helping to protect the skin from environmental factors. Each of these oils helps to promote collagen production and cell turnover.